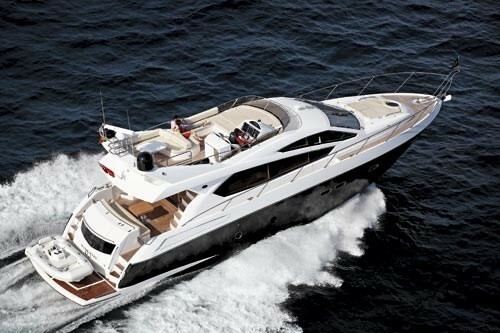 The Manhattan 63 exhibits classic design with excellent use of space. Whilst being slightly smaller than the Manhattan 66, the 63 can still comfortably sleep eight guests in four cabins, making this yacht feel much bigger than it is. Built in 2012, the interior decor is stylish and modern and is finished in American walnut giving it a light and luxurious feel. The galley is open in its design, allowing plenty of sunlight to flow through the communal space on the main deck. With one twin and one bunk cabin, ‘Imolyas’ is able to cater to a number of different group dynamics. The master cabin and forward VIP cabin are both tastefully finished and are complete with en-suite bathrooms and flat-screen TVs for when guests want to relax below decks.